Mining in Latin America: Can Countries and Corporations Share the Wealth? When Pueblo Viejo, one of the world’s largest gold mines, opened in the Dominican Republic this year, the government expected a financial windfall that would help relieve its economic dependence on tourism. The world’s largest gold producer, Canada-based Barrick Gold, had signed a contract that aimed to share billions in profits with the Dominican government over nearly three decades the mine would be in operation. Yet, even before commercial production began in January, the mine had run into controversy. Environmentalists feared a return of the degradation, including habitat loss and water contamination, they had witnessed when it was a state-run operation. Activists warned that the mine’s sustainability and its benefits to local communities were limited. Economists questioned the pact the government had struck with the company and whether the returns would be fairly shared. The original agreement was struck in 2009 when gold traded for around US$800 per ounce on the spot market. Since then, it has exceeded record highs, before leveling out — bouncing around US$1,375 per ounce in recent trading. Within months, calls to nationalize the mine began growing. Buses and taxis sported bumper stickers promoting the idea, and a steady steam of protests put pressure on Dominican President Danilo Medina. Medina, in turn, used his annual address to congress to threaten the company. “Barrick gets $97, the people receive three,” he said, drawing applause and grabbing headlines in the next day’s newspapers. “I am making a final request to Barrick Gold to strike an agreement. We’ve been patient, but our patience wanes when we see extreme poverty in the streets. The government will not stand by in negotiating with Barrick,” he said in the nationally televised address in late February. Medina went on to mention the possibility of new legislation that would raise taxes on the company. By May, Dominican customs officials prevented gold shipments from leaving the country, claiming the company was not following regulations and, therefore, owed roughly US$1 billion in penalties. The headache was so large that within weeks the company’s top executives were on a plane bound for the capital, Santo Domingo, to renegotiate the contract. The stakes were high: Pueblo Viejo, with 25.3 million ounces of gold reserves is the world’s second largest mine by reserves. Barrick and Goldcorp, another Canadian mining behemoth that owns 40% of the operation, had already invested US$4 billion, according to the companies. When the executives and Dominican officials concluded their meetings, an agreement was struck that left government representatives claiming victory. Instead of waiting for years to receive revenue sharing, the government will see benefits immediately. This fiscal year, the government will receive approximately US$550 million, according to the terms of the tentative agreement. Over the lifetime of the pact, the Dominican government is due an estimated US$1.5 billion more than what it expected to receive under the original agreement. The numbers are not precise because they depend on spot gold prices of US$1,600 per ounce. While analysts have favorable expectations, the market is potentially volatile, especially over the long term. The agreement spared the company from the type of stalemates that the mining industry has encountered elsewhere. But the fact that the disaccord occurred after only a few months into the mine’s operation underscores the pressures mining companies face. The high prices of precious metals in recent years pushed the industry to expand into previously unexplored territories. In those communities, social unrest, environmental concerns and streaks of nationalism have conspired to force mining companies to adjust the way they conduct business, analysts say. With the industry facing external pressures, including a recent drop in commodities prices, the need to work closely with foreign governments and communities where the mines are based – often poor and rural and, in some cases, home to indigenous populations – is greater than ever before. In many ways, the pressures on mining companies are similar to those faced by other multinational corporations, says Paul Klein, president and founder of Canada-based social responsibility advisor Impakt, which evaluates social corporate responsibility programs for companies. “Are communities looking more closely at the way corporations impact them socially economically? Definitely. Are investors? Yes, they are much more now because it’s seen as an area of risk. Are regulators looking more closely at all industries? Definitely,” he says. What makes the industry unique is the large-scale impact mines have on the communities in which they operate, says Klein, who has written about ways mining companies can improve relations with communities and foreign governments. For years, record high prices of metals such as gold, silver and copper, higher demand for commodities and shareholder demands for greater profits drove mining companies to expand operations into previously untapped regions. From established mining-friendly countries like Peru and Chile to smaller economies, like the Dominican Republic and Central America, Latin America has seen a dramatic increase in mining exploration. When commodity prices were lower, many sites were deemed too expensive to mine. But when investors began pouring money into precious metals and expanding economies, like China, began demanding more commodity metals, mining companies began looking at lands that would have previously been considered too expensive. Consider gold. A decade ago, an ounce traded for around US$400, meaning only large, readily accessible deposits were financially feasible to exploit. But the precious metal, a popular hedge against inflation, reached a record high of US$1,921 per ounce in September 2011. Instead of concentrating their operations in the big four gold mining countries – Canada, the United States, South Africa and Australia – companies began to venture into smaller, and often less politically stable, countries. Several Latin American countries that had few or no large-scale mines soon became the target of large gold companies. Governments in those markets have also tried to capitalize on the high commodity prices by forcing mining companies to pay more royalties and higher taxes while tightening regulations. In 2011, South American mining leaders Chile and Peru were among the many countries across the globe to raise royalties, which are charged on revenue rather than profits. Other countries threatened to nationalize parts of operations. 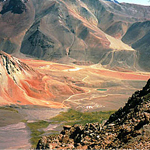 Last year, Bolivia withdrew a concession it had granted to a Canadian silver mining company. In March, Colombia canceled 32 concessions, mostly to coal mining projects, because companies had failed to make payments or fulfill obligations of their lease, according to the country’s mining ministry. Venezuela, meanwhile, has threatened wholesale nationalization of some mining projects. “Increased resource nationalism: We just faced that with one of our mines in terms of higher asks by governments — whether it’s for taxes, a bigger piece of the pie. So there’s more risk now in the environment,” Barrick CEO Jamie Sokalsky told analysts at an investor’s conference in May. Mining in foreign countries, especially in the developing world, is risky. Economies — like that of Chile — have grown, in part, due to the industry. Yet many in foreign governments and activist organizations zero in on mining, considering it a neoliberal threat. By nature exploitative, mining is considered by those who oppose it as an interloper intent on raiding natural resources while leaving behind little more than environmental destruction. Protests, anti-mining campaigns and a well-established network of human rights groups and activists team up to disrupt mines, pressure shareholders to take action and lobby governments to set up stricter regulations. “Issues around sustainability, the environment and human rights have escalated into more frequent episodes of community activism and social unrest,” wrote researchers at Deloitte in a paper focusing on the largest challenges the mining industry faced in 2012. Those disruptions have a direct impact on the bottom line. Henisz, a principal in the Washington D.C.-based political risk consultancy PRIMA LLC, says corporations have written off billions of dollars before realizing a more effective strategy is to work with the communities and stakeholders. Changing the approach to stakeholder involvement “usually begins after about US$1 billion in write offs. If you put enough zeros behind something, the CEO and CFO start to say, ‘Something here has to change,’” Henisz notes. As problems have mounted, the need for working with communities early and effectively has become more obvious. Change has gradually come to the industry. Corporations, particularly senior mining companies with large staffs and the capacity to hire staff dedicated to community engagement, have made strides in their corporate social responsibility programs. These companies are working with local communities, governments and grassroots organizations. Solid corporate social responsibility programs have gone mainstream, but their financial benefits are not always obvious. In a study looking specifically at the mining industry, Henisz and his research partners found that the value of effective engagement with stakeholders – from local NGOs to activist organizations and community groups – is more valuable than the gold itself. Henisz and his team analyzed 19 publicly traded mining companies and roughly 50,000 mining activities – everything from protests to delays – and found that companies could drastically improve profits if they worked closely with communities up front. Mining companies are beginning to recognize the value of such relationship building, Henisz adds, but external factors may force companies to cut back on those plans. The need for working effectively with stakeholders will be heightened in coming years as forecasters predict commodity prices continue to drop. Gold futures for June delivery, for example, fell to US$1,373.50 per ounce on the Comex in New York. While the mining sector has made strides in improving its work with communities, financial realities are mounting, causing corporations to reconsider the costs associated with stakeholder engagement, Henisz says. “There’s a real risk that with commodity prices coming down, these are the departments that will be cut,” he notes. Cloud platforms enable companies to offer enhanced digital experiences to users without needing to invest in on-premises technology, according to experts from Wharton and SAP.